Nebraska recently signed into law LB959, a bill that lets employers share more information to prospective employers about current and former employees with less threat of legal liability. In a nutshell, employers will be given a rebuttable presumption of good faith when they follow the law’s specific requirements. Employers should learn the new law’s requirements, and very real limitations, before changing policies, procedures and forms. Whether the employee is eligible for rehire. Employers should not be lulled into false confidence by this new law for several reasons. The protections are quite limited since the authorization is valid for only six months. Also, the presumption of good faith on the part of the employer does not apply if information disclosed turns out to be false and the employer either knew it was false, or acted with malice or reckless disregard for its truth. Where particularly subjective information is shared, such as the quality of job performance, this means employers may have little actual protection from lawsuits. Finally, the good faith presumption on the part of the employer can be overcome with a finding that the employer discriminated or retaliated because the employee “exercised or is believed to have exercised any federal or state statutory right or undertaken any action encouraged by the public policy of this state.” In summary, significant risk remains, and employers should maintain their caution when sharing any information about current or former employees. Those wishing to obtain the protections of the law should examine and alter current policies and procedures with advice of counsel. Potentially conflicting legal requirements and company policies should be considered, for example, those pertaining to drug and alcohol tests. 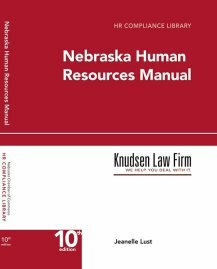 The new Nebraska law makes no direct changes to those, and many company policies provide assurances of confidentiality. Reference release forms and applications must also be reviewed, and will most likely require alteration to be in compliance. And as before, an employer’s best practices include keeping tight controls on the release of such information, with only one person in a company designated (and properly trained) to do so.